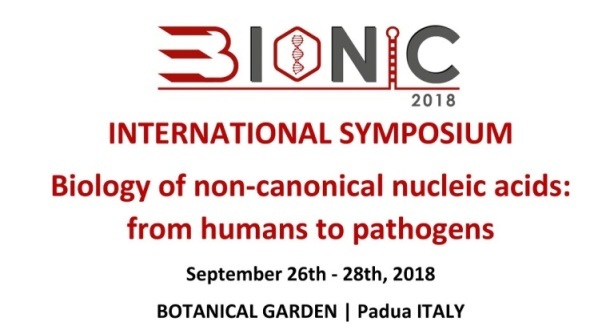 The international meeting BIology of nOn-canonical NucleIc aCids: from humans to pathogens (BIONIC) will take place on Sept 26th-28th 2018 in Padua, at the Botanical Garden historical location. Nucleic acids with structures different from the classic Watson and Crick double helix are increasingly being recognized as important regulators of the genetic function. Indeed, non-canonical nucleic acid structures have been shown to regulate the genome of humans, other eukaryotes, prokaryotes and viruses. The meeting will cover all aspects of non-canonical nucleic acids, from biological activity in humans and microorganisms to structure, from methods of detection to targeting. All major and renowned experts in this area, from Europe, USA, Asia and Australia will be present. The meeting aims at presenting the latest discoveries in the field, bring together and confront researchers and expose junior scientists.